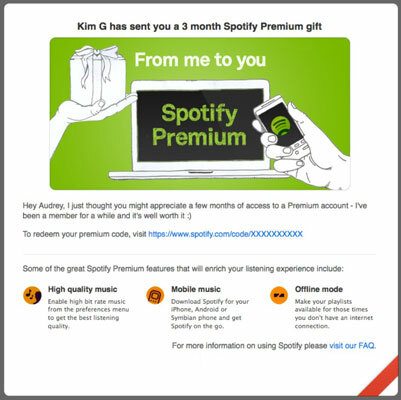 Why not gift someone withr a Spotify Premium subscription valid for either 1, 3, 6, or 12 months? Maybe your lucky recipient can’t afford to upgrade to a Premium plan just yet, or perhaps you want to show her exactly what it’s like to be part of an exclusive inner circle. When you give the gift of Spotify, Spotify e-mails your friend an electronic greeting card that’s personalized with your message and includes a link to your friend’s Premium code. You can also print the message if you want to mail it or add it to a paper greeting card. It’s no big deal if you absolutely hate the look of the e-cards that Spotify issues or you somehow forget to print or send it. You receive an e-mail receipt for your transaction, which includes the gift code. Then, you can write the code down on a birthday card or plaster it on a giant billboard (oh, wait . . . but only if your friend is the only person who would see it!). Click Log In at the top-right of Spotify’s website. In the pop-up window that appears, click Log In with Facebook and enter your Facebook details (if you aren’t already logged in). Or, if you have a Spotify username and password, enter this information in the fields provided. Your Spotify account page opens in your web browser. Click your account name at the top-right of the Spotify window, select Share Spotify from the drop-down list, and then click the Buy an E-Card link. From the options that appear on the Spotify Premium Gift page, select the subscription gift that you want. Prices for your region show up alongside the subscription lengths. In the U.K., you can choose between 1 month (£9.99), 3 months (£29.97), 6 months (£59.94) and 12 months (£119.88). In the Order Details section, confirm your e-mail address and country. Remember, your card needs to be registered to the same country your Spotify account is registered to. In the Personalize section, select an image to use for your card by clicking that image. At the moment, you have only two options: In addition to the gift illustration shown, there’s also a congratulations image. In the fields provided, enter your name, the recipient’s name, his e-mail address, and a short message. HTML code to make words bold or italicized doesn’t work; you need to type your message in plain text. (Optional) Take a look at your message before continuing by clicking the Show Preview button. A window pops up showing what your card will look like. After you’re happy with your card’s message, click Continue. From the options provided, choose either a credit card or PayPal as a payment method. Spotify accepts Visa, MasterCard, and American Express. You can also pay by using PayPal as long as your account is registered to one of Spotify’s countries. Select the check box to say that you agree to the Spotify Terms and Conditions, and then click Continue. You can click the link to read the Premium Code Terms and Conditions. On the page that appears, enter your payment details, including credit card number, expiration date, and security code, in the appropriate fields. If paying with Visa or MasterCard, the appropriate authentication scheme appears and prompts you to enter random characters from your MasterCard SecureCode or Verified by Visa password. On the page that appears, the personalized card you designed is displayed and ready for you to print (there’s also an onscreen option to e-mail it to your friend, if you prefer). You receive the actual code as an e-mail receipt, so you can put that code in your own message, if you want. Codes are valid for one year from the date of purchase. European consumer law means if you buy a code from there, you’re allowed a refund 14 days after you buy it, as long as it hasn’t been activated. In the U.S., you’re entitled to a refund if your code doesn’t work. If the recipient of your gift code is already a Premium subscriber, the code simply extends her subscription period. People who already have a Spotify account but are on either an Open or Unlimited plan temporarily upgrade for the duration of the code. The recipient’s account page informs him of the subscription’s expiration date. He can always pay to keep his subscription going after the time period expires! You can’t yet buy gift codes for Unlimited subscriptions, only Premium subscriptions.